Every year , same BORING gifts ! It's Valentine's Day, time to celebrate this special event with someone whom you loved and cared for all this while. Chocolates, sweets, roses for your darlings cost a lot on Valentine's Day as the price hike almost double of the normal price. Well, we have to admit, this is the only season when florists and sweet shops business are at brisk, hardly could cope with the increasing demand for these gifts. Everyone has been buying the same gifts every year, which gradually has become a trend to all people from different walks of life, all over the world. Which is the handmade gift you will likely make? 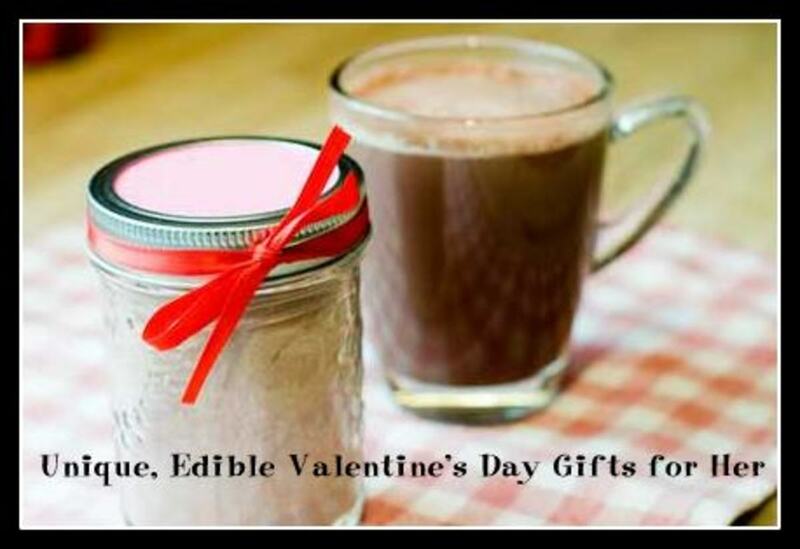 Goods news is, you don't have to spend much money on Valentine's Day gifts, especially when you are on a tight budget. Seems that everyone is having the same problem, isn't it? Anyway, this year, I figured out of making my own Valentine's Day gifts instead of forking out money from my pockets. It doesn't matter what you give. It's the thought that counts. Even though handmade gifts are cheap and simple, think of the bright side. Handmade gifts are unique in each way, they represent your love, your speciality and hidden talents to your love ones. From the look of your love ones' faces, you could tell their happiness, appreciation when they receive your handmade gifts. Trust me, you will feel pleased and contented with your results. 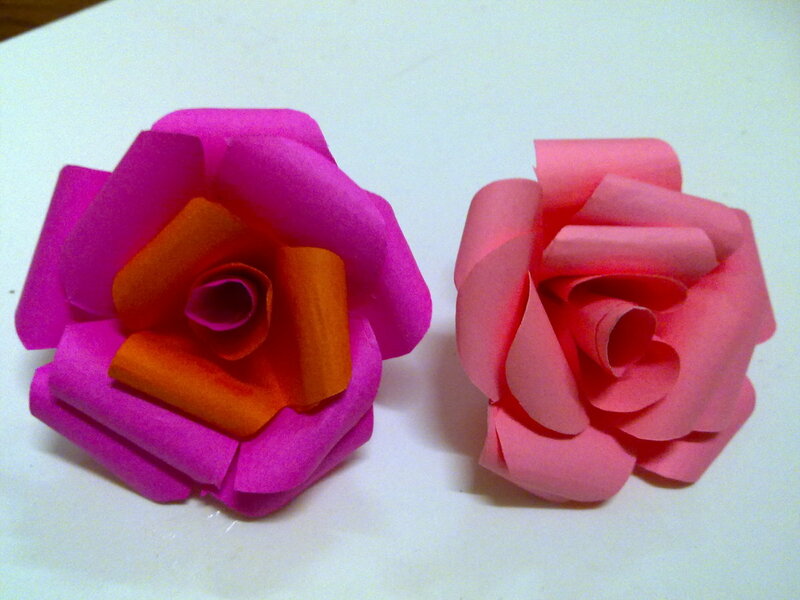 Here are some of my own Easy Valentine's Day Gifts which I had made the past few days. Hope that you will find the joy and fun in making them as much as I do. Do drop some comments and suggestions if you had any in mind. Love to share and improve. It doesn't matter if you don't have any experience in making handmade gifts. Rest assured that it is quick, easy and fun to make a Valentine's Day card with your own creativity and outstanding ideas. 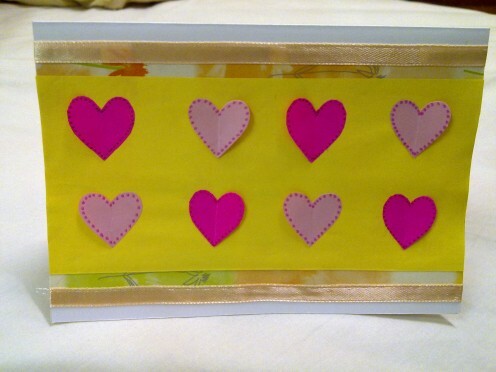 I used whatever materials I had in hand and worked with left over gift wrappers, self-decorated hearts with colourful markers and simple ribbon to brighten up the borders of the Valentine's Day card. If your sweetheart loves butterflies, she will definitely love this handmade card! 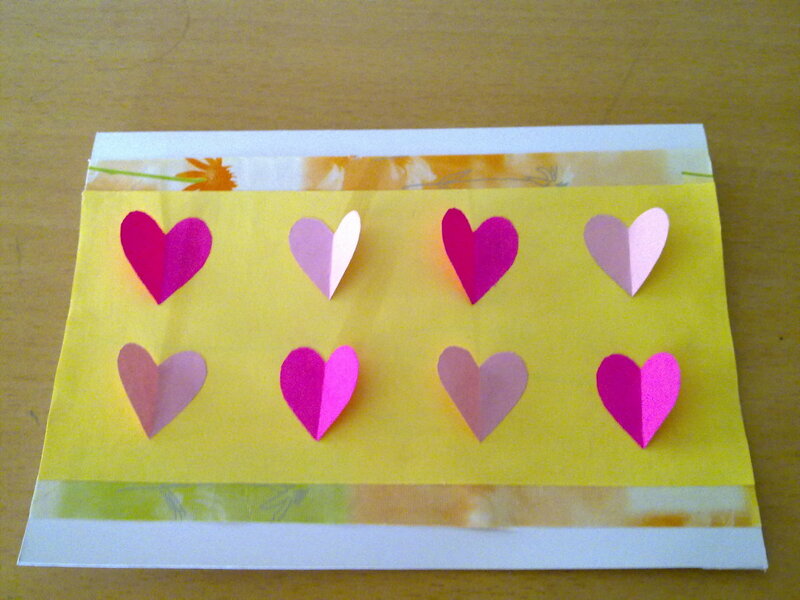 This handmade card is specially for couples, 2 big hearts with a ribbon on each heart. 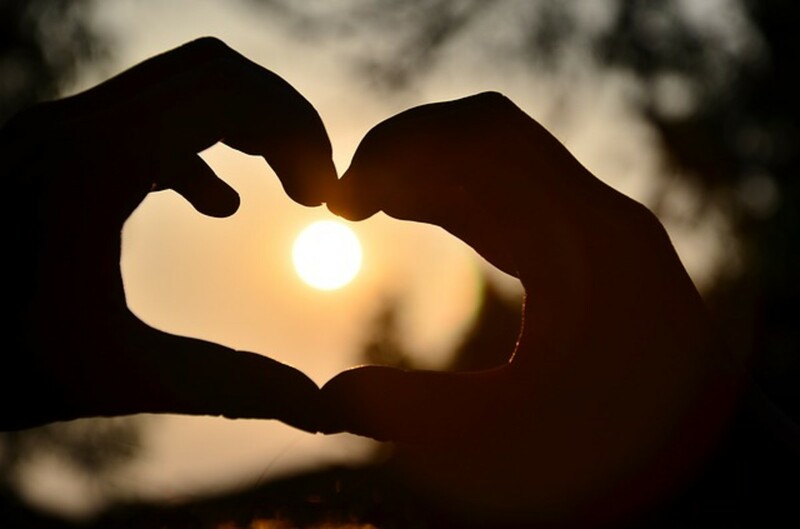 It shows two hearts meet each other to become one love. Lovely bright red, pink colours that matches Valentine's Day theme. As you can see, this card doesn't requires much materials. Therefore, it doesn't take much of my time, quick and easy to make. You can add some side borders such as patterns with colourful markers if you like. I love folding origami paper crafts, making my own birthdays and all year round festive season greeting cards. Problem is, the color papers aren't cheap either. Fortunately, I stumbled upon Global Art Folia origami color paper which comes in 10 different colors, 500 pieces in a pack and perfect for practicing. The main reason I bought this color paper is the price, extremely cheap for a pack of 500 sheets that could last me years! 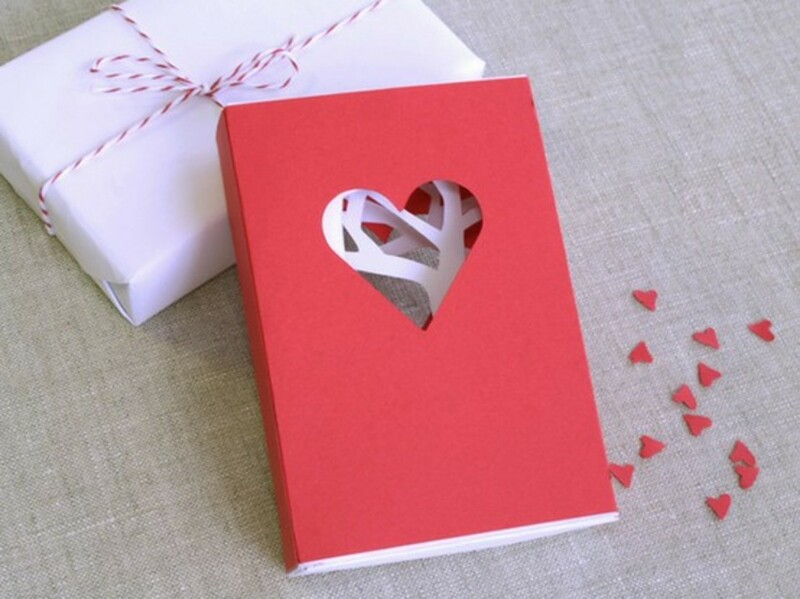 Mini paper hearts are the easiest way to win over your girlfriend or someone that you like for sure. 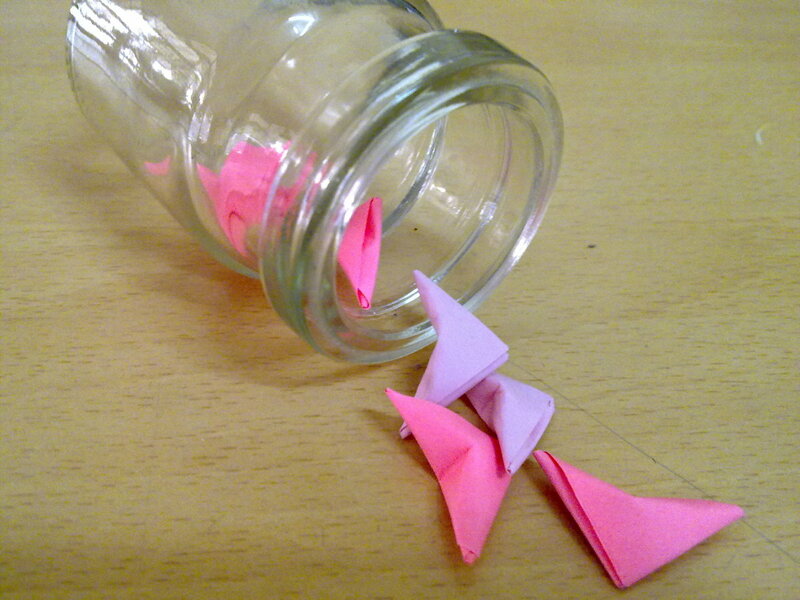 Put all these mini paper hearts into a beautiful glass bottle, accompanied with ribbons makes this a perfect gift for Valentine's Day. Guys shouldn't have any problem in paper folding since the method of folding this mini heart is simply just fold triangle over and over again. If you want to add more vibrant colours into it, mix with gift wrappers for a change. I have never own a sewing machine in my life. I had been reading lots of reviews of cheap sewing machine as I can't afford to buy the expensive , branded ones. Michley sewing machine had proven to me that my choice was right. This is a simple to use machine for dummy beginners like me to understand the concept how to put in the thread, bobbins problem and not to prick my fingers. I love the outlook of this sewing machine, cute and light. It sews pretty fast when I touch the pedal, as if I am driving a car. Always test out of scrap fabrics first. Once you are familiar with the steps, you can start with pyjamas, pot holders before you head for window curtains. 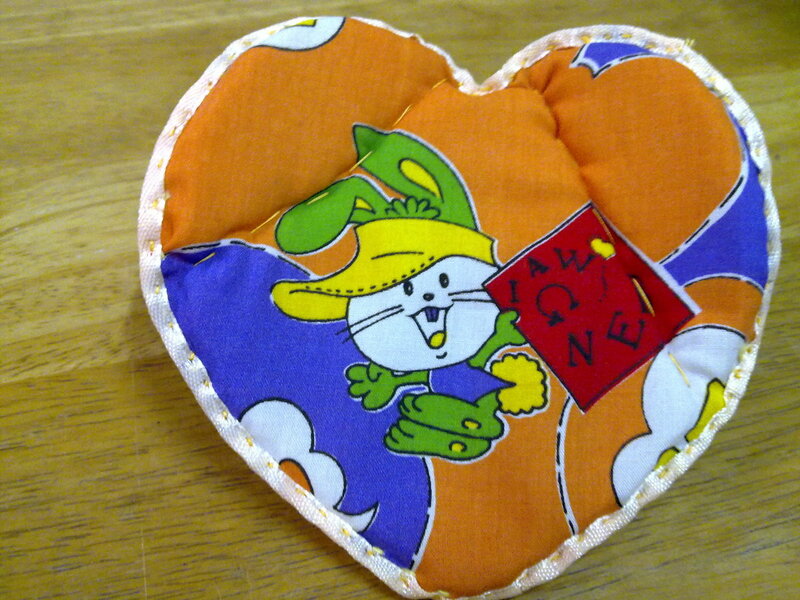 For moms, wives and sweethearts who cook for you, sew this Heart Pot Holder to show her how much you appreciate her effort and love the food she cooked. This pot holder is useful when she uses it to put on the pot that is hot, a hot cup of coffee or a cold jug of orange juice. You can use simple fabric, cotton fabric or old jeans. Just use whatever fabric you can find. It is washable and easily dries up because the inner fillings is made from sponge. An ideal gift for your wonderful " chef " ! If you are looking for a cute little gift that is adorable, useful and easy to make, this may be the right choice for you. 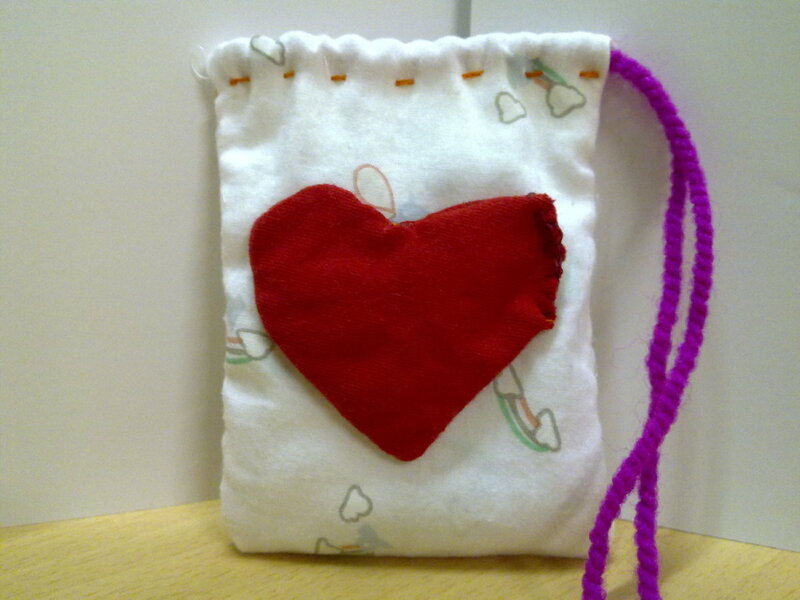 Cute Heart Pouch for ladies, girls and nieces. Small pouch is convenient when she puts in her purse, handbag and pockets. She may find it useful when she uses it to keep her belongings such as coins, ear rings, nail clippers, hair clips and other fashion accessories or even candies! A handy pouch that touches her heart. 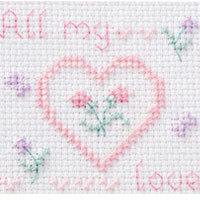 I find this Cross-Stitch Stand Card unique and beautiful. 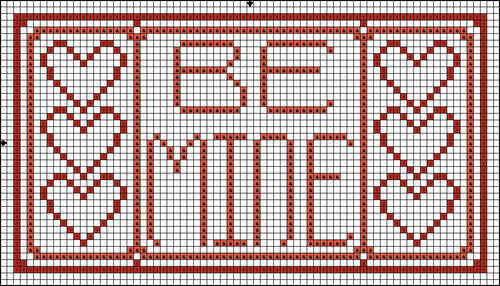 Initially, I planned to stitch this pattern for a handmade Valentine's Day card. 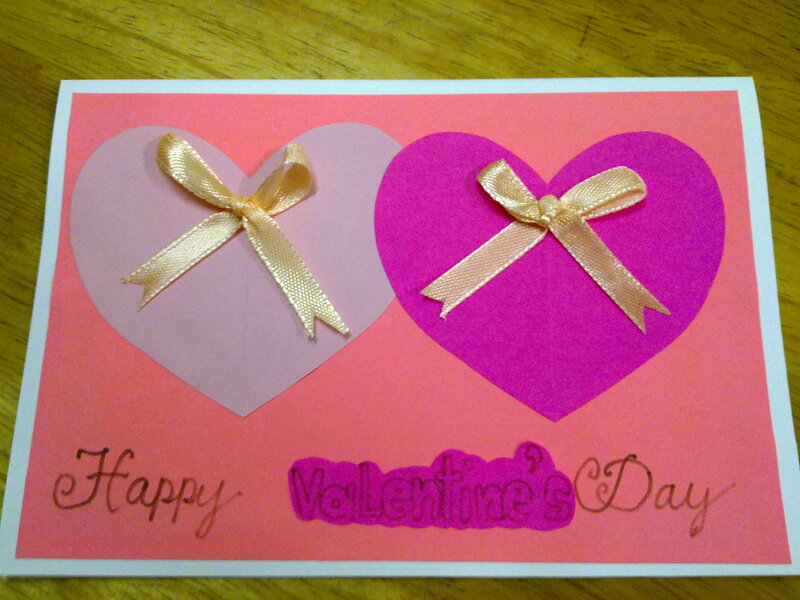 However, I already had made two cards. Hence, I decided to change it into a Stand Card instead. It fits well in a simple white matte paper card and looks presentable on the desk. I am sure your love one will always remember you whenever he or she sees this stand card. Easy to sew if you know how to stitch. If you are a beginner, take a look at the step by step procedures. Don't know what to say to your special someone? Write a Valentine's Day quote from famous people. These quotes will guarantee you that your sweetheart , best buddy or who ever it may be, feel appreciated and delighted. Best part is, you don't have to rack your brain for days and nights over a few simple lines, right? Food never fails to win over anyone's tummy for sure. Handmade cookies are easy to bake from scratch to follow with these simple recipe. I bet your love ones are eager to taste your cookies. 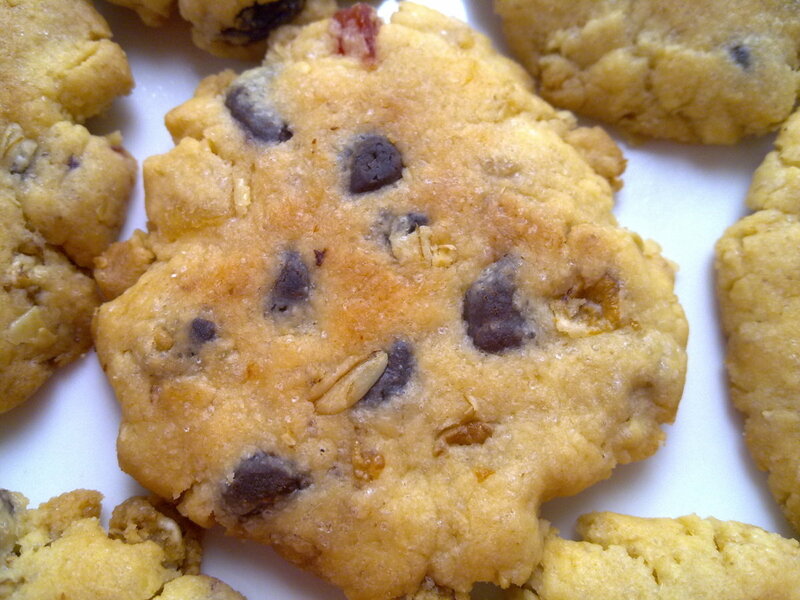 Chocolate chip cookies are crunchy, chewy and melt in your mouth easily. Quick and easy to bake. After baking, let the cookies cool off before packing them into small seal tight plastic bags or airtight container. Remember to wrap it up in see through plastic gift wrapper, tie it up with colourful ribbon. 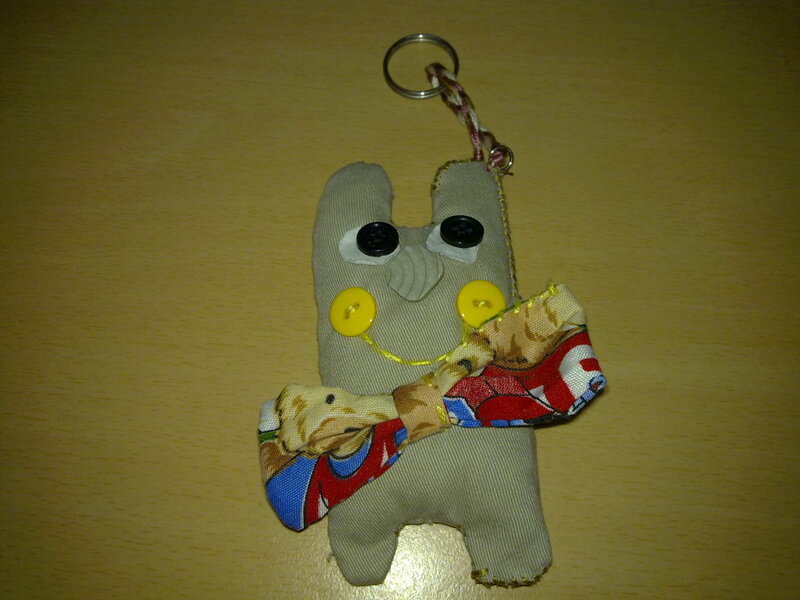 Many people use key chain to loop in their house keys and car keys. Some people love to collect key chains for hobby purpose. I believe everybody uses different key chains for different batches of keys. If you want your sweetheart, best buddy or friend to remember you, make a Fabric Key Chain for him or her. I use the letter "H" because it is easy to draw and sew, compare to other alphabets. I used buttons from old unwanted clothes and the fabric is from my torn pants ! Recycle all those unwanted clothes by making handmade gifts is the best way. Please cast your votes, Thanks! Which handmade Valentine's Day Gift do you like best? If you are lazy to dress up or can't get to book a table for two at any restaurant on Valentine's Day, consider whipping up a simple dinner for two at the comfort of your home. 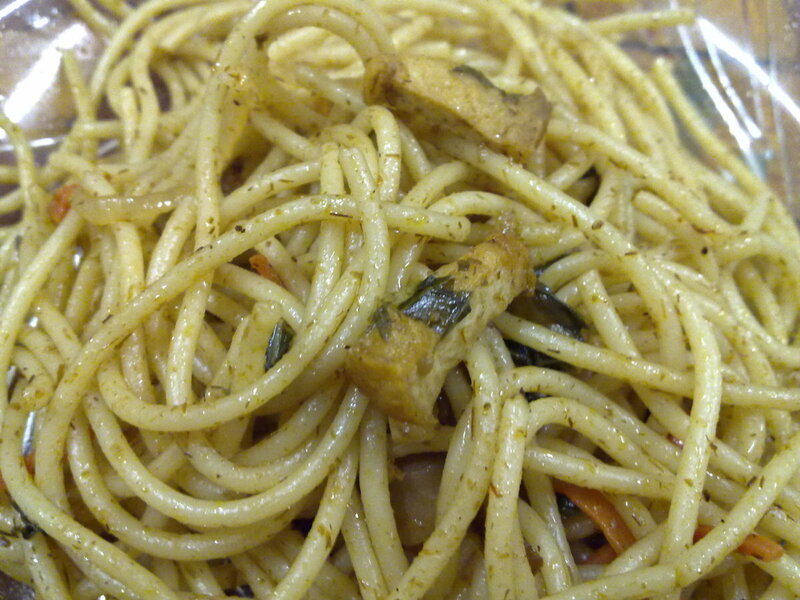 Tom Yum spaghetti is my hubby favorite meal all around the year. He could have two plates of this dish with a glass of wine. You can try mixing around the ingredients, seafood or vegetarian. My hubby loves seafood and extra spicy Tom Yum taste. SO, I add in extra Tom Yum paste with lots of shrimps which he enjoyed very much. What is your favorite Valentine's Day gift? Yes, i make all my holiday gifts and greeting cards. Save all the money and recycle at the same time. Love the inexpensive handmade ideas! Do you make all your holiday gifts? Love your ideas :) Here at my house we make a lot of our gifts too. The cross stitch, cards and cookies are all favorites here. Thanks for sharing more ideas!